DigitalGlobe has released a new commercial satellite image of the Fukushima Daiichi nuclear site in Japan taken at 10:55AM local time on March 17, 2011. Steam continues to vent out of the top of the Unit 3 reactor building. 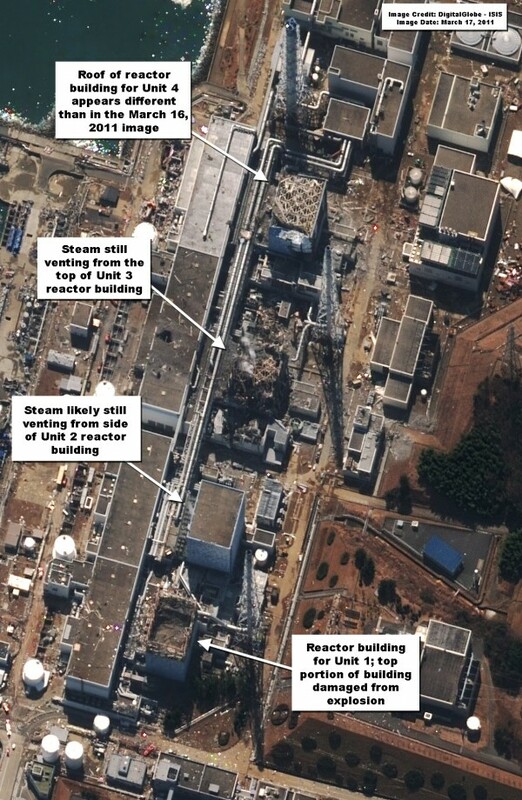 Steam also appears to be continuing to vent out of the side of the Unit 2 reactor building. The roof of the Unit 4 reactor building appears different than it did in the March 16, 2011 image. While the paneling on the roof of the building appears intact in the March 16, 2011 image, it appears that only the skeleton of the roof frame is left in the March 17, 2011 image. While it is possible that the varying angles of the images is affecting the appearance, the difference appears significant enough to indicate a structural change. It is unclear how the roof structure changed. With only a skeleton frame on the roof, it may be easier to deliver water to the spent fuel pond in Unit 4 from above.